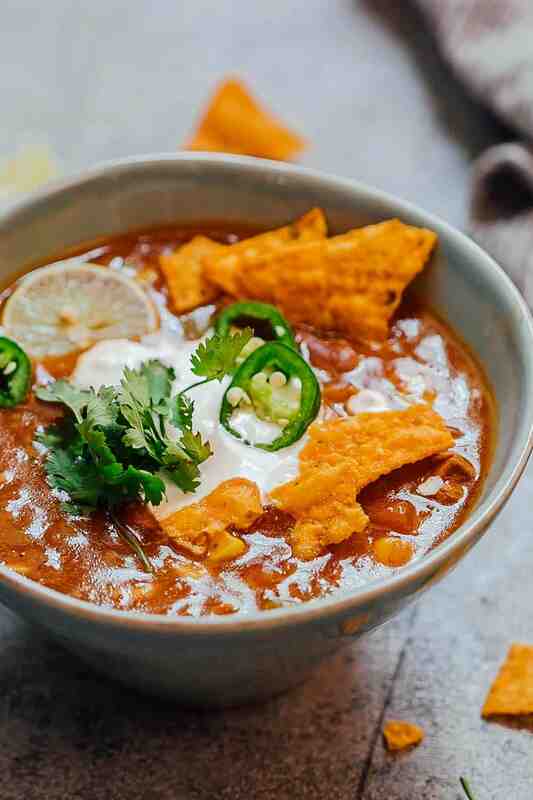 This Chicken Enchilada Soup recipe is like your favourite enchiladas but in soup form. 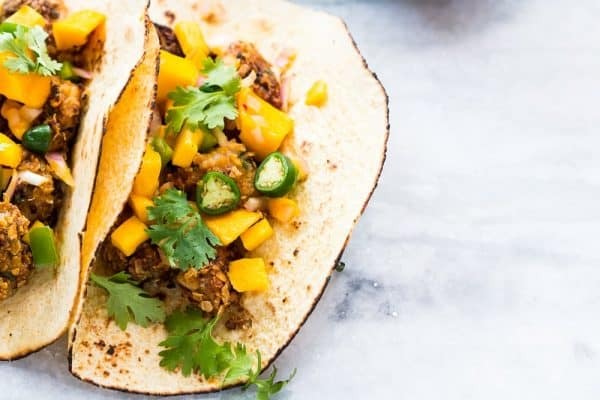 Totally hands off because this is pressure cooked in the Instant Pot and really fast to make. 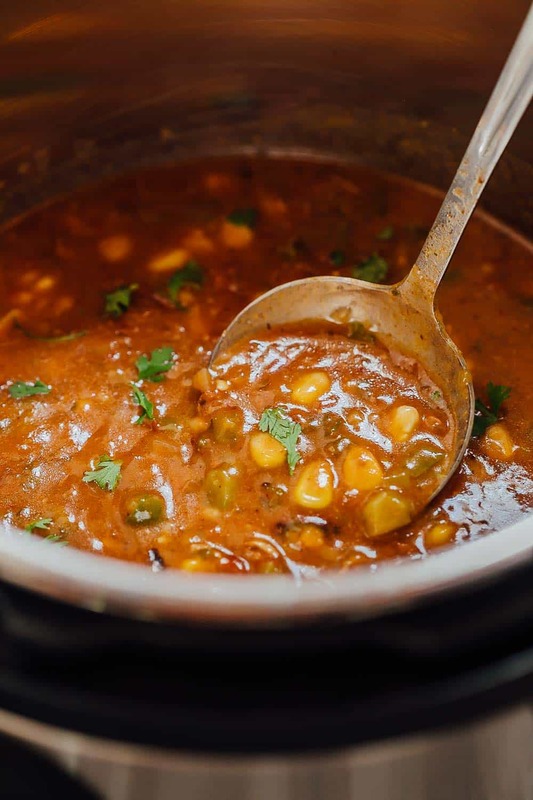 This thick, spicy soup is loaded with bell peppers, beans, corn and chicken and topped with sour cream and cilantro its pure comfort food! Lets just say that right now my world starts and ends with this chicken enchilada soup. It’s amazing how good, good food can make you feel. And I know some people think that I’m a food blogger so I probably have a feast every day for every meal. But guys, lets get real here for a minute? We have bad food days too. Quite a few of them especially when I’m recipe testing and things don’t work out. Like instead of a really freaking awesome broccoli cauliflower rice casserole, I’m left with a gloopy mess. Those are sad days. Very sad days. And then there are days like these. When everything goes right from the word go and we have something that’s so insanely good that us and the dogs are sniffing the air and waiting for whatever meal time comes next to hit us. Or maybe not. Heck, we just spoon it out straight from the pot. Also, trying to eat soup from a ladle as big as that one is not easy. There may be spills and dribbles on tshirts. So fair warning: don’t try this at home. 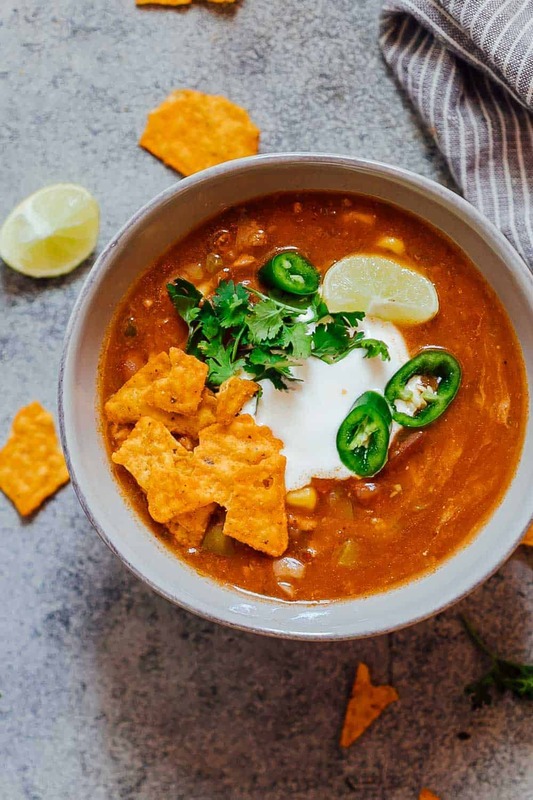 Let’s just talk about making this chicken enchilada soup in the Instant Pot. Its life changing. There is no stirring or watching over to see if anythings burning. It’s pretty much a dump and cook situation except for the onions and garlic which are cooked to get rid of the raw smell and bring out the flavours. Tomatoes: I’ve used fresh tomatoes here because we always have them in plenty but if you prefer the canned variety, go ahead and replace the tomatoes and the tomato puree with a whole can of peeled tomatoes. Just make sure to chop them roughly first. 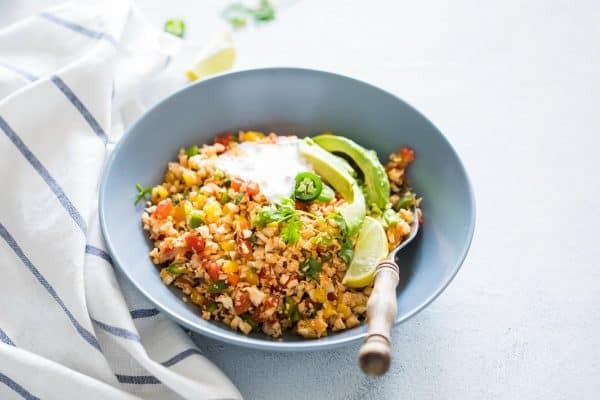 Enchilada Seasoning: The mixture of garlic, onions, cumin and paprika creates a homemade and very basic enchilada sauce flavour when combined with the tomatoes. I prefer the DIY instead of buying store bought seasoning to avoid any of the weird stuff, but if you want, you can swap the cumin and paprika for 2 tablespoons of enchilada seasoning mix. The extra garlic in the recipe won’t hurt. Chicken: I’ve tested the recipe with both chicken breasts and chicken thighs. Personally, I prefer the chicken thighs because they remain juicy even if you reheat the soup. With chicken breasts, I noticed that they taste good straight out of the Instant Pot but after reheating the pieces tend to get a little rubbery and chewy in spite of all the liquid and moisture. If you still want to use chicken breasts, just add 2 whole chicken breasts (not frozen), reduce the pressure cooking time to 8 minutes, take them out and shred them once cooked and add them back to the soup. Toppings: I would absolutely insist that you top this soup with stuff. My favourites are sour cream (or greek yogurt), a squirt of lime, cilantro and crushed nachos. Chopped red onions are also amazing in this soup which I add once in a while. I’ve been told by an American friend that this tastes like chili’s chicken enchilada soup, but chunkier because we don’t puree it. And you can also make this in a slow cooker which I’ll provide instructions for below. 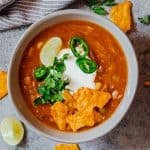 So if you don’t own an Instant Pot, go ahead and make this a slow cooker chicken enchilada soup. 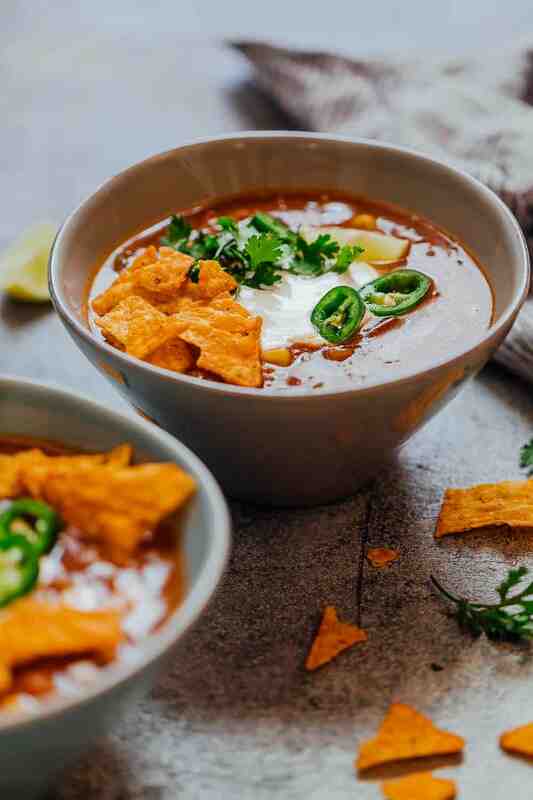 But whatever you do, trust me this enchilada soup is the boss of all winter soups – its thick, spicy and a bowl of comfort food. I also posted a Chicken Taco Soup on Spend with Pennies that you’ll love! Instant Pot Method: Turn on the saute function on the Instant Pot and heat oil. Add garlic and onions and saute till the onions are soft and translucent. Turn the vent to sealing, and add all the remaining ingredients except cornflour. Pressure cook on manual for 12 minutes and release pressure manually once cooked. Switch to saute again and mix cornflour in 1/4 cup water till dissolved. Add it to the soup and mix well. Let the soup simmer for 4-5 minutes till it thickens. Serve hot with your favourite toppings. Slow Cooker Method: Heat oil in a pan and add garlic and onions. Saute till the onions are translucent and then transfer them to the slow cooker along with all the other ingredients except cornflour. Cook on high for three hours or low for 5-6 hours. Mix cornflour in 1/4 cup water till dissolved and add it back to the soup. Mix well, and cook on high for 15 minutes or so till the soup is bubbling. Serve hot with your favourite toppings. Would the timing change drastically between an instant pot and pressure cooker? They will change slightly Natasha. If using a stovetop pressure cooker, pressure cook for 3 whistles. How good, when a good food makes you feel amazing! Whatever you eat, but soup is boss of all food. A balanced diet like soup is a must for healthy lifestyle. I am putting this on my must try list, Richa! Looks so flavorful!